One year ago, on 23rd of May, a new independent designer company was born: Sofilantjes. Well, what’s new, you’d say? 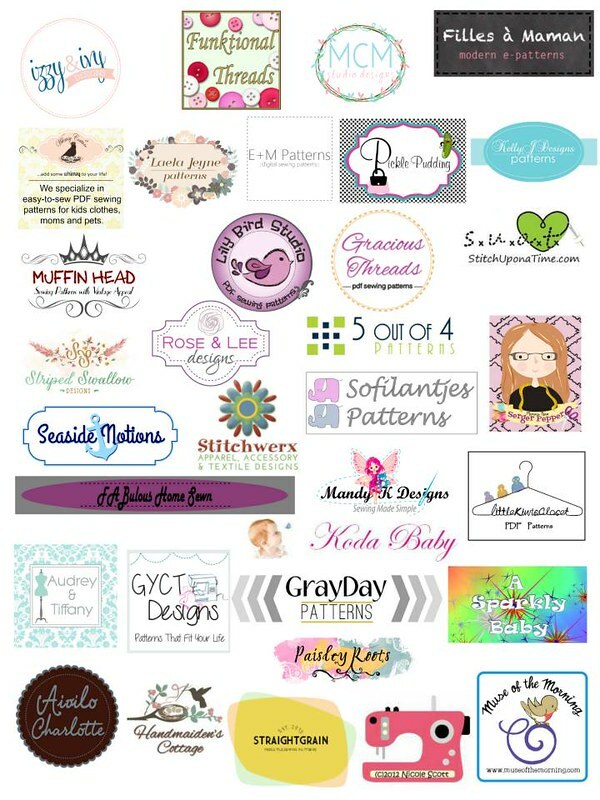 So many indie designers are opening up businesses these days, right? But I think Sofilantjes has something more than many others. I had the opportunity to test one of its patterns about 8 months ago, so I virtually “met” Anne, the mind and designer behind the name, long before this blog tour. She was kind with us, testers, understanding and what’s more important, she did her best to listen to our feedback and fix any “glitches” in the pattern or the instructions, so that anything could be as close to perfection as possible. I really enjoyed working with her. Then, in a couple of occasions, we exchanged a few messages, and I was really pleased and conquered by her kindness. 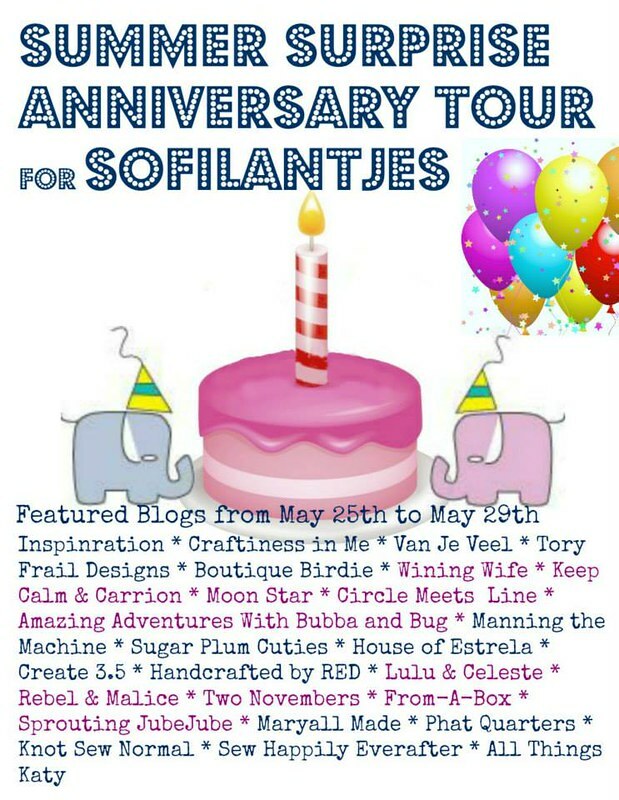 That’s why, when I saw the opportunity to take part in a blog tour to celebrate the first anniversary of Sofilantjes, I didn’t hesitate. The pattern we all made and interpreted is the Summer Surprise, the first pattern ever to be launched by Anne. It’s a knit top and dress pattern, with a… surprise! It comes in two size ranges: 6 months to 7 years and 8 to 16 years. 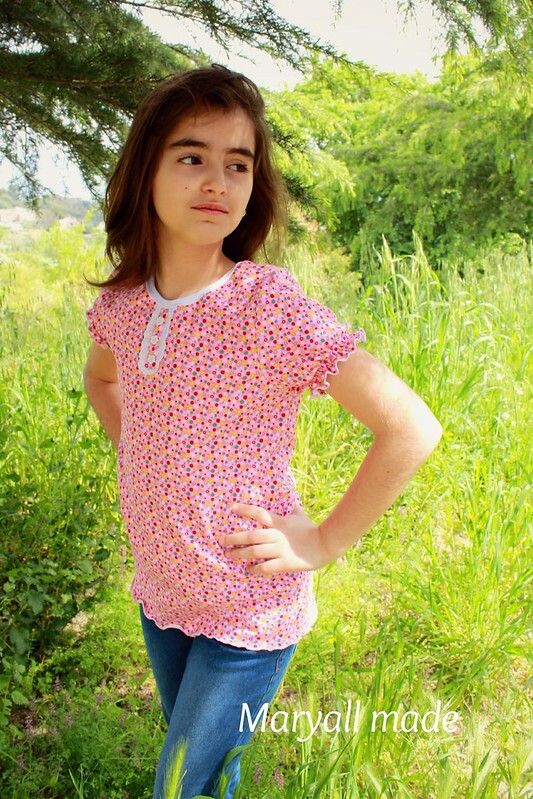 It also comes with the options for top/tunic or dress, and normal/skinny sizes. I find this particularly useful for me, since my 9 year old daughter is as tall as an 11 year old, but her chest measurement is normal for her age. So I made size 11, the skinny version. I found that the pattern runs true to the child’s measurements. I already owned the pattern, so I could verify by myself that the pattern has been updated into a new, better format. 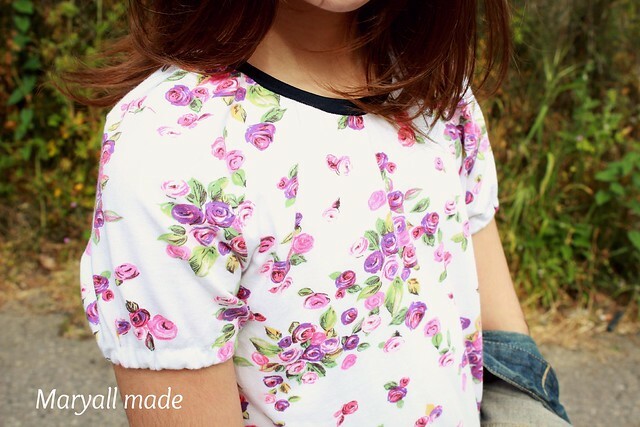 The pattern pieces are layered, so you can print your size only, and you are also instructed which pages to print for the option and size you want to make. This is a feature I particularly love in a pdf pattern – knowing I can save paper and ink makes me happy even before I start! For those who look for this kind of information: you have three pattern pieces only for each option (top or dress) – front, back and bow. You are given measurements for the neckband, armhole bands and bow knot band. 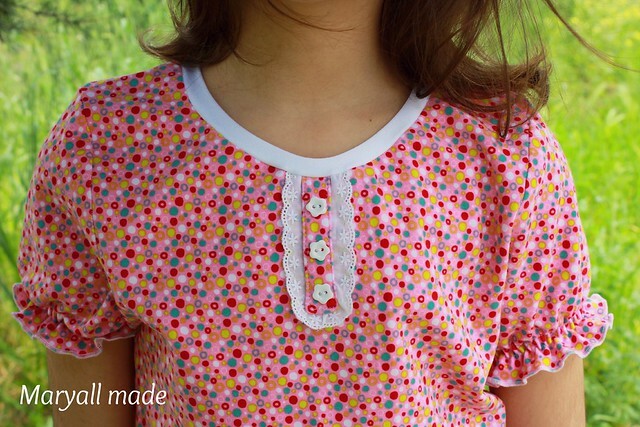 This makes it a pretty easy and quick sew, maybe a couple of hours from printing to finish. 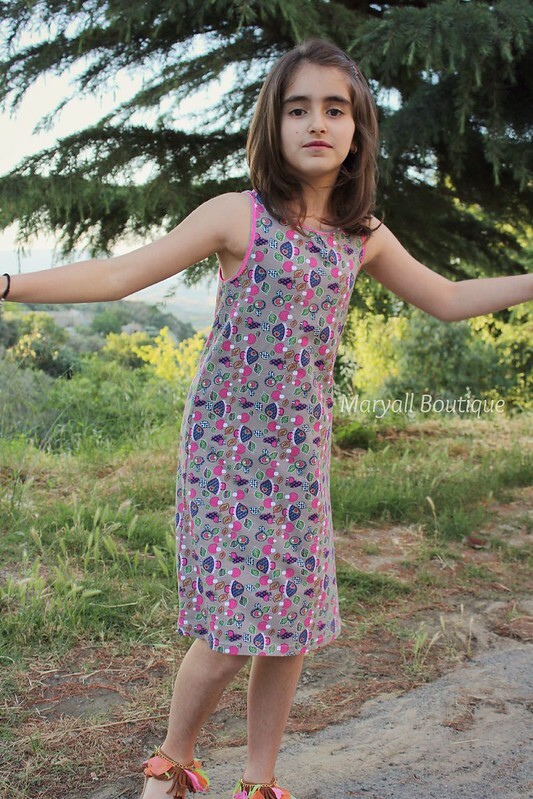 She even wanted to show that you can run, play and jump in a dress! Aww, this girl! The Summer Surprise (individual patterns) are ON SALE from the start of the tour untill May 30th. You need to use the code: anniversary and get 25% off on Sofilantjes. During the tour there is a new giveaway every day, with pattern bundles fom many other designers as prizes, so visit the other participants in order to take part! Check their blogs for the daily giveaways! FAQs: if you bought the pattern on Sofilantjes before the update, the pattern in the new format can be downloaded from your account on the site. If you bought it on Etsy, won the pattern or tested it you can send an e-mail to info@sofilantjes.com with the subject: summer surprise, and e-mail a proof of payment or copy of Anne’s e-mail. The pattern itself did not change. Just the format. My daughter’s summer wardrobe is getting full now. I think she doesn’t need stuff anymore. 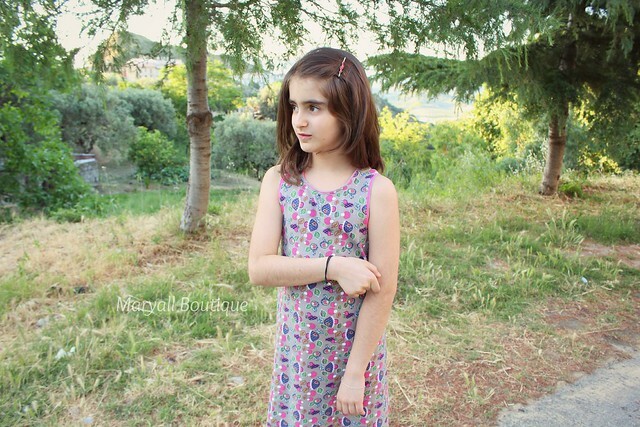 In fact, I have tested mostly patterns that fit perfectly into her summer style – good for play but also really cute and girly (for an almost 9 year-old, that is 😉 ). I totally agree with the description. There is one pattern piece for the top, and one for the dress, with different necklines for front and back. 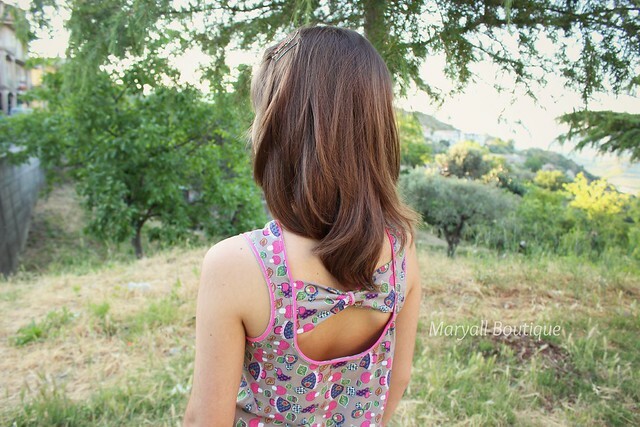 You can choose to either cut your back first, then cut the neckline for the front piece, and then cut your tee or dress front, or to print the piece twice, so you don’t need to bother with cuttings or tracing. I find this to be really nice especially when you want to save paper and ink. For the skirt, you are given measurements. The instructions contain clear and detailed illustrations. 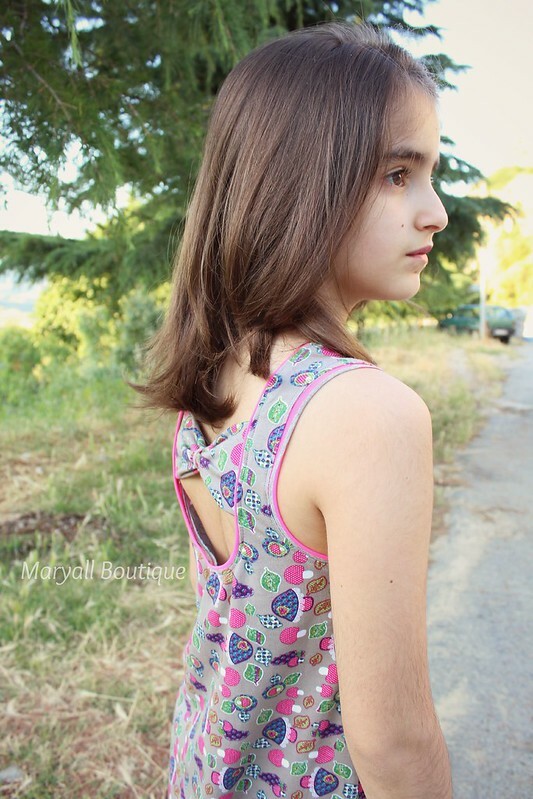 This is such a quick sew, that you can fill your daughter’s wardrobe in just a day! I made size 10 top and skirt for my tall daughter. The fit is really good, based on the sizing table. I went up only because my daughter is much more taller than average girls. Fabrics: I used a 95% cotton – 5% spandex jersey knit for the tee. It was too simple and grey for a girl, so I topstitched it with yellow thread, and applied a colourful patch on the chest. 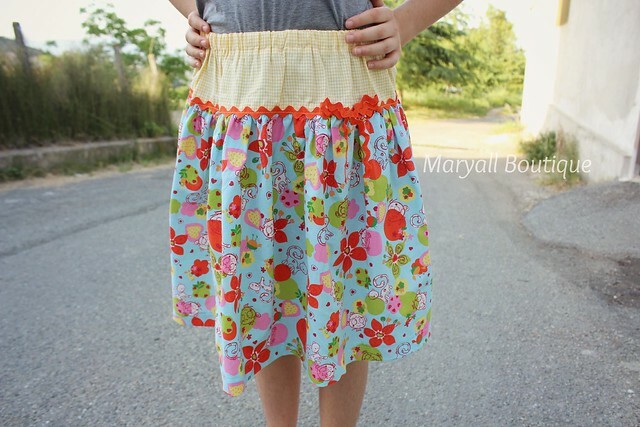 For the skirt, I used a yellow gingham cotton for the waistband/upper part (one piece only), and a printed cotton for the rest of the skirt. The pattern calls for ribbon on the seam between the two fabrics, but I didn’t have any that was suitable, so I went for an orange ric-rac which I sewed with a yellow thread, too. The pattern is split into two size ranges: 2-7 and 8-16. I only have a daughter, so I love that I can buy larger sizes for her, without having to spend any money on sizes I’d never use. What are you sewing now? 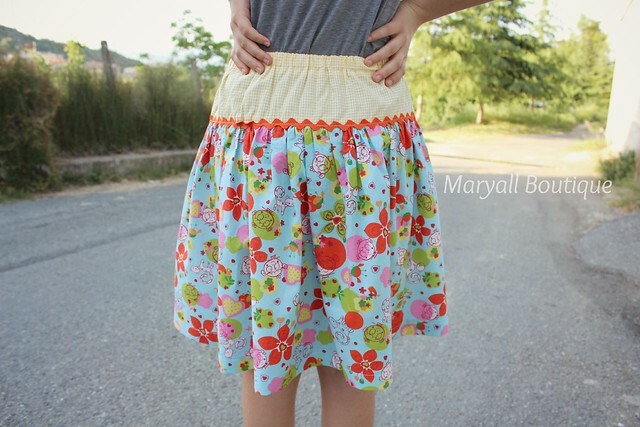 Are you done sewing for the summer? So I haven’t been blogging for quite some time. Let’s just say I chose to sew instead of writing (so, my pile of finished items still to blog is long, until last Halloween long). 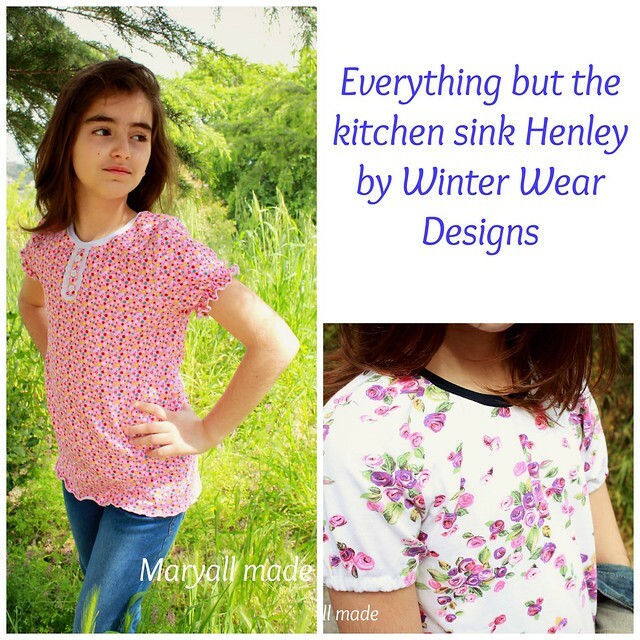 Here’s one of the latest patterns I’ve tested: the “Everything But The Kitchen Sink Henley” by Winter Wear Designs. “I designed this shirt to be your go-to shirt pattern. It really does cantain everything but the kitchen sink, and there are plenty of ways to play with it beyond all the options in the instructions too!!! If you were going to a deserted island with your sewing machine, a pile of fabric and only 1 top pattern – this is the one you should take! Hahahah, ok but really, let’s look at your options. 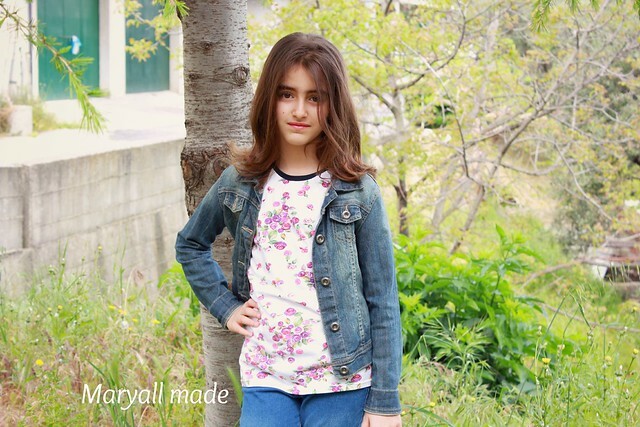 Sizes included are 1 to 14, plus it’s suitable for both girls and boys! I made two in just a few hours: the first one with the faux henley and shirttail hem. I changed it a bit, and instead of doing the sleeve hem and shirt hem as per instructions, I did a lettuce hem and shirred the sleeves with two rows of elastic thread sewn at 3/4″ from the edge of the sleeve. I love how it came! 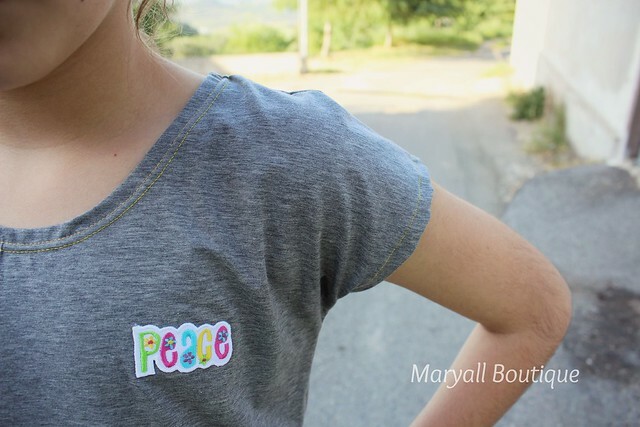 I used cotton+spandex jersey for the tee and lycra for the neckband, for both my versions. I am in love with this tee! 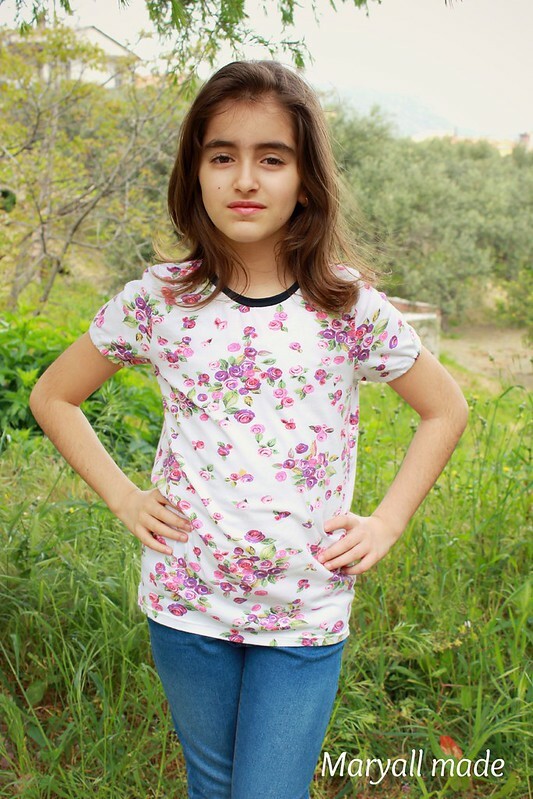 I have been browsing the online stores I usually buy from, for more nice fabric in order to make more of these tees for my daughter, as they are both practical and really cute!